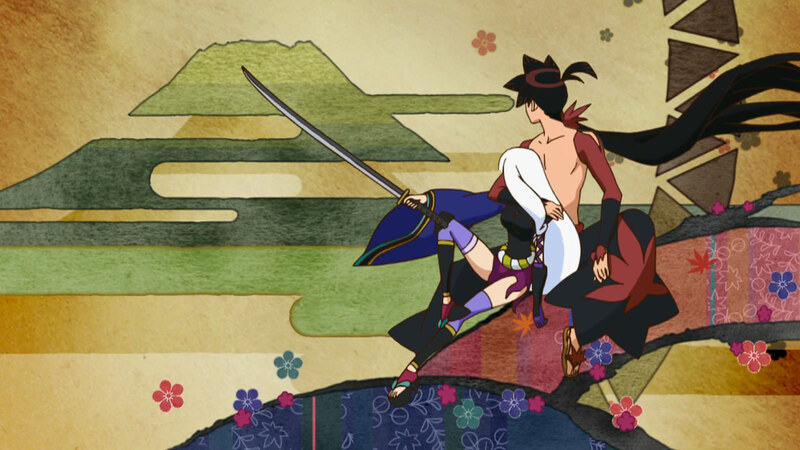 Katanagatari came out way back in 2010, but which is being re-aired on TV on the famous Noitamina time slot. It’s a damn fine show that I think didn’t get the viewership it deserved (thanks in part to its unusual hour-long episode per month release format), and so we here at Metanorn will be running a series of podcasts on it, following the show as it re-airs. If you haven’t watched it already, I hope you give it a shot (heck, it’s already released in the US)! Indeed, Katanagatari was a show I was given as a “challenge” watch by my friend and fellow podcast host Amuro, and I’m glad he recommended it to me. I’m glad to help lvlln out chatting about this fine series and I hope you enjoy the podcast. It gets better, I sw- wait actually, I don’t think it gets any better than this. Thanks for listening! Thanks again to Mr. Flawfinder for coming on; once again, you can find him at Standing On My Neck. If you’ve already seen the show or if you are watching it for the first time and are interested in coming on as a guest, please let us know in the comments, or shoot me an email at [email protected]. I remember it getting some hate when it aired, but I enjoyed the show for what it’s worth. It was dialogue heavy (similar to Bakemonogatari) – lol at the tag “90 percent talk 100 percent awesome”. The art takes some time to get used to (don’t be turned off by the “cute” designs). It takes its time to get rolling, but it has great character development and pretty good action (though some of the fights I really wanted to see animated were omitted – I got trolled ToT). And the ending was really well done, even if it wasn’t the one I was hoping for. Highly recommended if you don’t mind dialogue heavy shows! This was one that I skipped out on during initial airing due to hearing that it was a “talking” anime. Conversations are fine, but I don’t like it when talking heads dominate screen time. It turned out to come through in the end, but the overlong conversations did work to the show’s detriment. BTW, the CD art pic above has a spoiler. While not a major spoiler, I’ve gone ahead and made a new file, though it might effect downloading via iTunes unless the RSS refreshes and corrects the file. Will still play ok and downloadable from the site. EDIT: File is now corrected. Thanks for noticing Akagami. I’ll be more mindful of that as we progress through the series. Gosh, I really did love Katanagatari, still one of my favorites in terms of animation aesthetics, BGM, and plot. While it was hot-and-cold with Togame’s character, I love how Shichika’s developed, especially how he started as a basically clean slate. The secondary characters were cool too, particularly Hitei-hime and Emonzaemon(both of whom new viewers will meet in a couple more episodes if I remember correctly). My only problem would have to be the dialogue-heavy sequences that were sometimes dragging and too witty for my non-Japanese upbringing. You guys mentioned the wait between eps. I don’t know how watching Katanagatari in one go feels but I did like the anticipation for it every month, and it wasn’t hard to get back into the plot even after 3-4 weeks. I guess the plot was simple in that respect, though complex in other ways. About the BGM, part of the reason I jumped on to the series because I heard Taku Iwasaki, who did BGM for the Rurouni Kenshin OVAs, was composing. I liked the bit of hiphop and jazz he mixed with the more traditional stuff – the setting to me was like someone put more funk into the Japanese Feudal Era and the music enhanced the feeling. As soon as the OST came out I got it and I listen to it still from time to time. My favorite tracks are Gettouka, Bahasa Palsu, Ao Zai and Peacock Blue Eyes. I don’t understand why they had to change the OP. Of course I’m always biased towards supercell songs versus other songs, but I like the visuals of the first one more. Just slightly disappointed about that, especially since the OP is now just animation from the episodes. The thing about the dialogue-rich scenes is that while I’m sure they were clever to Japanese speakers (I heard a ton of wordplay was used there), some of the wit didn’t translate well so I’m guessing this is where non-Japanese watchers got bored. I did like whatever I understood at the time (which was maybe 75% of the convos), but I had moments when I was just waiting for the next scene. But one of the best dialogues in the series was actually about the catchphrases, for me. Togame’s ‘Cheerio’ is actually confused with ‘Chesuto’ which is I think a battle cry by martial artists. Shichika’s is lovely, it gets pretty badass in the rest of the series. So yeah, I agree that the first couple of episodes aren’t the best way to bring in loyal viewers, especially in it’s first run when you had to wait a month to see if the next ep was any good. I mean, imagine having to do the 3 Episode Test in the span of 3 months. Not good for viewership at all. But I’m really glad I stuck with it, in any case. It DOES get better. I couldn’t find your email address on your Gravatar. Could you please send me an email, listed in the post, to arrange something? The soundtrack really is something else. I had a hard time conveying it while avoiding spoilers in this podcast, but that mix of modern sounds like hip hop with traditional Japanese ones fit perfectly for the story of this show. It also did some fun stuff visually in later episodes, mixing in visual novel style cut scenes or 8-bit video game action scenes which also created that nice mix of new and old. I loved this show. Felt bad about the ending, but it had to be.